At first glance, I thought the quilt block called Arrows looked pretty boring. However, once I played around with some colours and then created some sample quilts, I was quite surprised. This just goes to show that you can never underestimate what design may emerge as you move on in the design process to create your quilt. 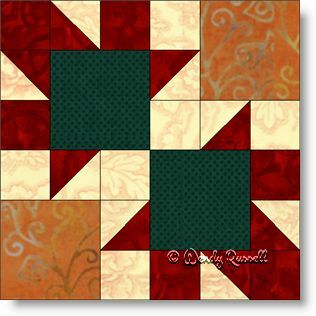 This quilt block is quite easy in that it contains only the simplest of quilt patches -- the square and the half square triangle, the two most frequently used quilt patches. This quilt block is assembled as a four patch, as the smaller patches are made into larger units, totaling four larger patches. As long as care in taken in the construction to make sure you achieve an accurate quarter inch seam allowance, you will breeze through making these blocks. The sample quilts illustrated show you just how very different your quilt can be from your friend's quilt, just by choosing a different layout of the final blocks.